How is Frank and Kick’s task force shaping up during the first season of the Gone TV show on WGN America? As we all know, the Nielsen ratings typically play a big role in determining whether a TV show like Gone is cancelled or renewed for season two. Unfortunately, most of us do not live in Nielsen households. Because many viewers feel frustration when their viewing habits and opinions aren’t considered, we’d like to offer you the chance to rate all of the Gone season one episodes here. 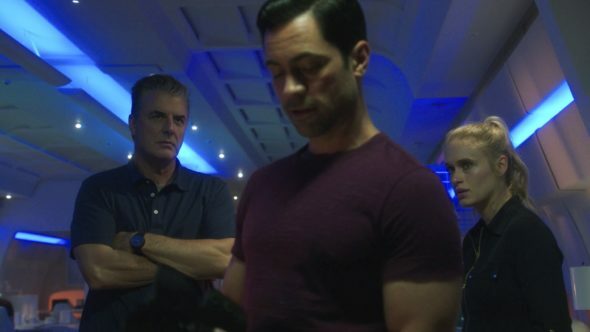 A WGN America crime drama, Gone stars Chris Noth, Leven Rambin, Danny Pino, Andy Mientus, and Tracie Thoms, with Kelly Rutherford, Jordan Bridges, Christopher O’Shea, and Lee Tergese recurring in the first season. The procedural centers on Kit “Kick” Lannigan (Rambin), who survived a high-profile child-abduction case, and the man who saved her, FBI Agent Frank Novak (Noth). Now, because of her unique insight and post-kidnapping training, Frank has recruited Kick for his new task force focusing on abductions and missing persons.